A faculty-led study abroad program this spring saw 22 students in the Kansas State University College of Business Administration travel to Europe to gain a better understanding of the global marketplace. The group, which was led by professor of marketing Swinder Janda, spent 10 days visiting the sites and touring international businesses in London and Munich. 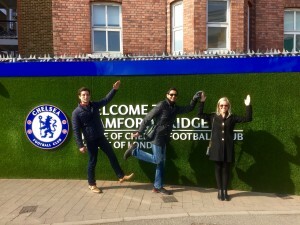 In London, the students were lead on business tours of Wimbledon, Chelsea Football Club, and Fuller’s Brewery. They also took a hop-on hop-off bus tour of the city and had a chance to ride the London Eye Ferris wheel. During their time in Munich, the group took a guided tour of a BMW manufacturing plant, and a tour of BMW Welt. Visits to Gorge in Garmisch, Neuschwanstein Castle, a cultural show at the Hofbrauhaus and a sightseeing bike tour gave students the opportunity to explore German culture. The College of Business Administration offers several study abroad experiences throughout the year. For more information on study abroad programs in the CBA, email Swinder Janda (swinder@ksu.edu) or visit http://cba.k-state.edu/current-students/study-abroad/index.html.